Resistance to the First World War Exhibition Event. Friday 25 January. 1:30 – 3:30pm. St Mungo Museum. 2 Castle St, Glasgow G4 0RH. This event will showcase the work of WEA Scotland adult learners in Dundee, Edinburgh and Glasgow who investigated the experiences of First World War Conscientious Objectors from their communities. Booking Required. 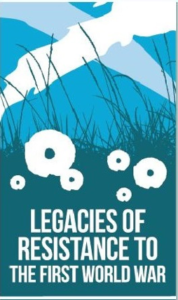 Email a.campbell@wea.org.uk with “Legacies of Resistance to the First world War: The Stories of Conscientious Objectors – Event and Exhibition” in Subject line. More than 1,300 Scots claiming exemption from military service as conscientious objectors. WEA Scotland adult learners in Glasgow, Dundee and Edinburgh explored the histories of some of these COs. Some were granted conditional exemption. Most were denied CO status, arrested and imprisoned, repeatedly in harsh conditions. Many were sent to work camps on the Home Office Scheme. A few died, in or soon after imprisonment. Learners also investigated the role of COs in their communities. Presented here are a bootmaker, a coal miner, a University lecturer and the Chief Engineer on the Forth Road Bridge. They held diverse views, from Quakers to internationalist socialists to members of the United Free Church and Roman Catholics. Uncovered letters and autograph books illustrate the stories of these men who were united in refusing to take part in a war that claimed the lives of some 135,000 of their Scottish contemporaries. Here are their tribunal statements, accounts of their loves and losses, drawings of their prison cells, and learners artistic responses to the lives of these brave and determined men who followed their consciences even when it cost them dearly.